Medical Tourism is where people who live in one country travel to another country to receive medical, dental and surgical care while at the same time receiving equal to or greater care than they would have in their own country, and are traveling for medical care because of affordability, better access to care or a higher level of quality of care. "Domestic and International Medical Tourism" is where people who live in one country travel to another city, region or state to receive medical, dental and surgical care while at the same time receiving equal to or greater care than they would have in their own home city, and are traveling for medical care because of affordability, better access to care or a higher level of quality of care. Medical tourism can be broadly defined as provision of "cost effective‟ private medical care in collaboration with the tourism industry for patients needing surgical and other forms of specialized treatment. This process is being facilitated by the corporate sector involved in medical care as well as the tourism industry - both private and public. 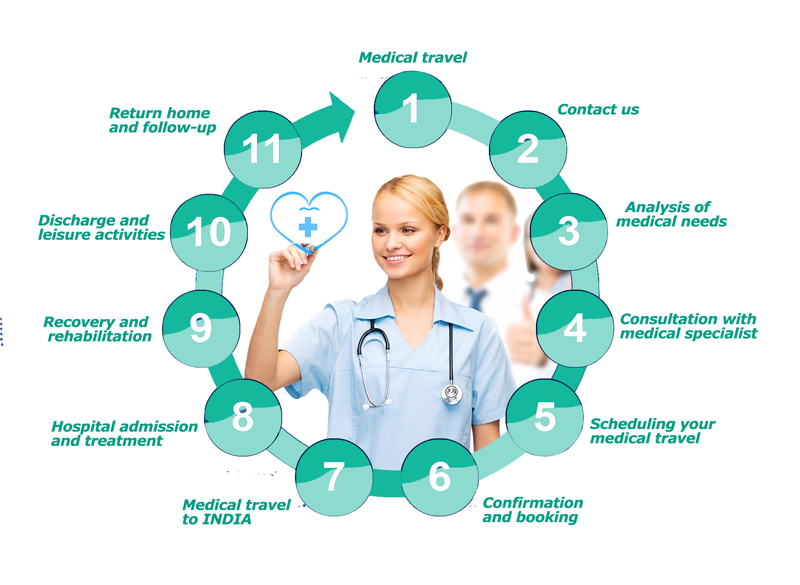 India is a leading player in the medical tourist/healthcare Facilitation industry. It is increasingly emerging as the destination of choice for a wide range of medical procedures. , India offers the latest medical equipments and technology for treating various medical conditions, the cost for a treatment in India, being much lower than in many other countries, the infrastructure and healthcare facilities offering world class standards. India has a large number of medical professionals highly educated, Leading surgeons and Doctors, and well versed in English , from heart surgeons to yoga experts . Also, India combines the best of healthcare with an exceptional holiday. Because there are many hospitals and doctors, in India a medical tourist can choose from a large number of healthcare providers depending on his pockets. It is also good to know that travel to India is easy because medical visas are now offered quickly and if your medical treatment takes longer than you expected your medical visa can be easily extended. Within India, we have partnered with world-class private care hospitals, which provide quality medical services at affordable prices for our clients. We have worked with these facilities to ensure that they will deliver a service that will meet our high expectations. Galaxy Healthcare India is one the most innovative and youngest & Medical Tourism Service Providers in the World. Comparatively lower expenditures for medical surgeries, transplants and treatments- a fraction of the cost of UK/USA private surgery.